Ever wonder… Where does coffee come from? Sure, it comes from the coffee house or grocery store, but where do the beans come from? Who cares for them? How do they get to your favorite coffee house or grocery store? 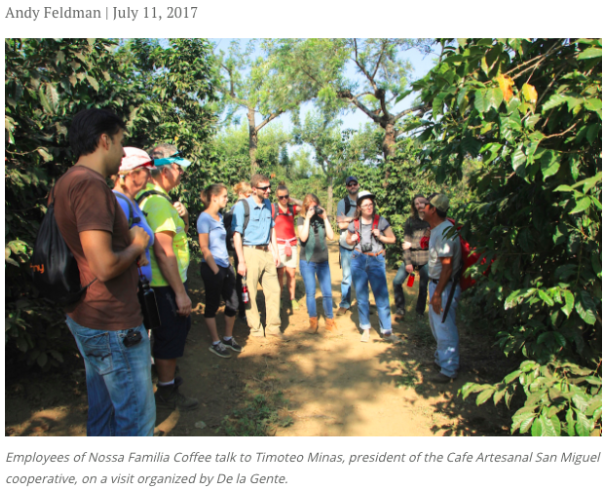 “The direct trade movement places a heavy emphasis on origin — from a marketing perspective, a coffee quality perspective and an economic justice perspective. As such, a growing number of specialty coffee roasters are spending time at origin, working with farmers to ensure they receive the desired quality outcomes while generating the desired community impacts. This ranges from the larger direct trade pioneers like Intelligentsia, Counter Culture and Stumptown, to growing players like PT’s and Bird Rock, to scores of smaller roasters scattered throughout the globe.A typical articulation of the benefits of these direct trade efforts boils down to a variant of, “intermediaries are bad, and because direct trade eliminates them, it must be good.” This belief is cultivated among specialty coffee drinkers, who are allowed to envision their roasters working around an obsolete system of intermediaries to offer both farmers and customers a better deal.